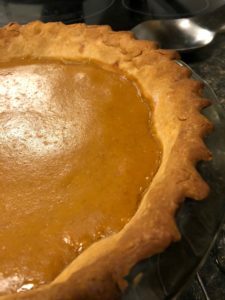 Pumpkin pie is one of my favorite desserts and is simple to make. Roasting a pie pumpkin in order to make your own pumpkin puree is easier than you think and is super tasty. Using a sharp knife, cut the pumpkin in half lengthwise. Then using a sharp spoon to scrape out all of the seeds and strings (the seeds can be saved to roast later). Brush the pumpkin flesh with oil and place face down on the baking sheet. Pierce skin a few times with a fork or knife to let steam escape. Bake for 45-50 minutes or until fork easily pierces the skin. Remove pan from the oven, and let the pumpkin cool for about 10 minutes or until cool enough to handle. Scoop the flesh into a high-speed blender or food processor and blend until smooth. Will need approximately 2 cups of pumpkin puree to make the pie. Preheat oven to 425 degrees F. Lay pie crust out in pie dish. Mix the pumpkin puree and spices together. Slowly mix in the sweetened condensed milk and eggs to the puree until just thoroughly mixed. Bake pie at 425 degrees F, for 15 minutes, then reduce temperature to 350 degrees F for an additional 35-40 minutes. Thoroughly cool the pie before serving. Enjoy with whip cream!